Do you remember where you were when you first realized the severity of the drought in the Western US? I would guess that you weren’t staring at a cloudless sky or a dry faucet. You were probably looking at a photo of Folsom Lake. Although drought conditions were technically declared after the low-precipitation winter of 2011-2012, there was still a general lack of awareness—or maybe ambivalence—around the issue. Most California residents I spoke with at the time didn’t even seem to know this was happening in their own state. All that changed at the beginning of 2014, when a series of comparison photos showing California’s dwindling bodies of water began going viral. The photos were part of a collaboration between NASA and the state of California to increase understanding of the drought. One of the most popular comparison shots showed Folsom Lake, in Northern California. The first photo: A seemingly infinite deep blue pool, a white blur of water gushing over the spillway. The second photo: A dusty rock-strewn landscape that was more Mars than California. Websites began publishing the before-and-after photos of Folsom Lake using slider tools and animated GIFs. For the first time, and within an instant, you could grasp the concept of how low these California reservoirs really were, and more importantly, share your concern with others. Our story, for example, was read by almost a million people. Suddenly, the world was riveted. About 25 miles northeast of Sacramento is the confluence of the North and South Forks of the American River, whose waters sweep down from the white serrated peaks of the Sierra Nevada. The American is a boisterous river—to this day it is very popular for rafting—and flooding regularly swamped the valleys below, including the growing city just downstream that would soon be named the state’s capital. There were several attempts to control the American starting in the late 1800s, but the smaller dams could not withstand the powerful springtime storms. In 1948 the Army Corps of Engineers began construction on Folsom Dam, pouring the first concrete in 1952. The goal was not only to prevent the American River from overflowing its banks but also to funnel enough water to fuel the booming agricultural business in the state’s Central Valley. The dam was completed in 1955 and not a moment too soon—that winter saw record-breaking precipitation and the dam likely saved Sacramento from devastating floods. (An auxiliary spillway will be completed in 2017 to add another layer of flood protection). When full, Folsom Lake holds about 975,000 acre-feet—enough water to cover the state of Rhode Island with 1.5 feet of water. During an average precipitation year, an estimated 2.7 million acre-feet of rain and snowmelt from the Western flank of the Sierra Nevada flows into Folsom Lake. Also in a normal year, the lake features 75 miles of shoreline with recreational opportunities managed by California State Parks. Like 19 other reservoirs in the state, Folsom Lake is now part of the U.S. Bureau of Reclamation, suppling drinking water to local cities and irrigation districts for the Central Valley Project, a gigantic network of canals and pumping plants. Folsom Dam is also home to a hydroelectric facility that provides 10% of Sacramento’s electrical needs. And it provides water and electricity to Folsom Prison, the correctional facility made famous by the Johnny Cash song. The first dam on the river was built here, in the late 1800s, by the hands of prisoners. 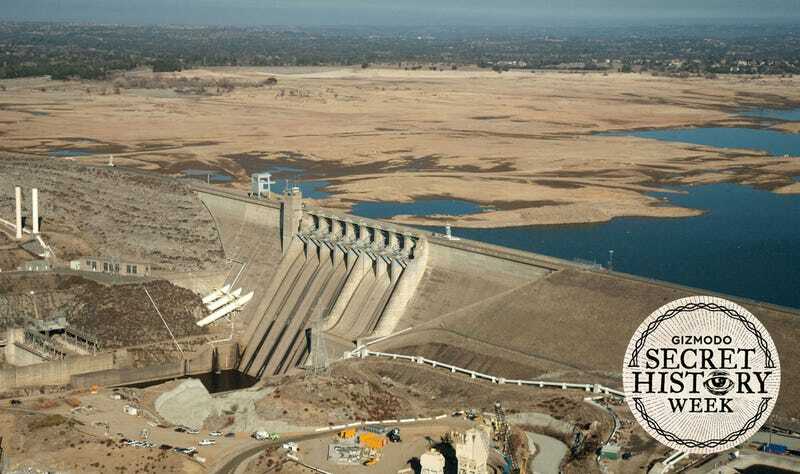 All of the Central Valley reservoirs have been affected in some way by the historic lack of rainfall, but there was another reason Folsom Lake became a posterchild for the drought. As the summer heat sucked reservoirs dry, Folsom Lake yielded some of the most dramatic images—including a few very interesting discoveries when the water started to disappear. In what may be the drought’s sole silver lining, withdrawing waters throughout the parched West slowly began to reveal architectural treasures thought to be lost. Folsom Lake had its own secrets. In early 2014, the quickly depleting lake revealed a mining town which hadn’t seen daylight since the valley was first flooded. The settlement was named Mormon Island, and it was founded in the mid-1800s on the banks of the South Fork of the American River. Gold was discovered here in 1848, making it the second significant strike after the one at nearby Sutter’s Mill which sparked the state’s Gold Rush. Prospectors dug a canal off of the American River to look for more gold, making this one of the first major river diversions in the state, and, it could be argued, the birthplace of water policy. Mormon Island suffered a devastating fire in the late 1800s and didn’t have many residents when it was evacuated in the 1940s to make way for the reservoir. But the drought was able to peel back what little history that had been left behind. As the waters retreated even farther in 2014, a new breed of prospectors swarmed the area with metal detectors looking for evidence of the drowned town. Visitors could be seen climbing over surprisingly intact rock walls and nearly complete foundations, matching up layouts of the buildings with old maps of the town. The hardier foragers dug through buckled slabs of mud, unearthing bits of infrastructure like rusted hinges or artifacts like soda bottles. The lake continues to reveal surprises from its now-arid depths. Last week, a mother and son found a human skull. That meant the lake’s capacity was approaching the danger zone of 100,000 acre-feet, when water levels would be too low to reach the intake pipes in the dam. This would most immediately and dramatically affect three cities which would have to draw water from other nearby districts, tap into groundwater reserves, or, worst-case scenario, implement rationing. The biggest area of controversy at Folsom Lake is the federally mandated amount of water released from the dam each year. Officials want more water to stay behind the dam’s walls to act as drought insurance, but the government has promised—actually over-promised—a certain amount to the interests downstream. This scenario changed a bit this year. In early 2015, Governor Jerry Brown issued unprecedented conservation measures that required urban water districts to cut usage by an average of 25%. Many water boards in the Sacramento region were able to conserve the amount required by the state. This summer, the state curtailed the rights of junior water rights holders in the region, meaning some of the least-prioritized farmers did not get to divert any water. In a way, this same hydrological dilemma is playing out at every major reservoir in the state: How do we save enough water to keep cities flush with drinking water, allocate enough water for agriculture to feed the population and boost the economy, and leave behind enough to nurture the fish in wild streams? These questions are central to the battle to reform California’s water rights and water policy. The fact that they’re being asked when there is literally no water left is very troubling. Rare late spring rains helped the lake to avert disaster in 2014. But by the end of 2015, after the hottest summer on record, Folsom Lake’s levels were taking a dive once again. Folsom Lake might be the most famous symbol of the current drought, but it is also a peek into an uncertain future. With summer 2015’s continued high temperatures, little rain, and almost no melting snowpack, Folsom Lake continues to suffer. The reservoir dropped three feet in September alone. When engineers designed the dam 70 years ago, they never even considered this scenario. On November 8, levels reached 143,363 acre-feet, the lowest levels ever recorded. It dipped to 140,410 acre-feet last Sunday. The lake is so low now that an emergency pumping system has been installed, preparing for levels to drop into the “dead zone.” In September, a series of pipes were put in place to act as a backup intake system. (Vegas is doing the same thing to Lake Mead, but permanently.) Now barges are being deployed to act as floating pump stations, ready to begin pushing the remaining water up over the dam and into the nearby city of Folsom. There is no rain forecasted for the region this week.